Week 10 of my 13 Week Rotating Menu Plan. This week features Lentils as our Stretchy Bean. I do my lentils a bit different than most of the other Stretchy Beans. 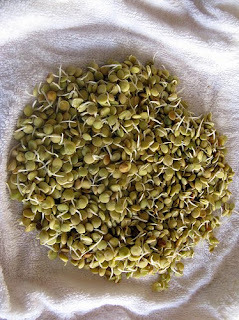 After soaking the lentils instead of cooking them, I let them begin to sprout (click here for sprouting directions). That night I use the amount of still un-sprouted but soaked lentils that I need, cooking them as directed by my recipe. Lentils cook very quickly especially after soaked (30-45 minutes is about the norm but sometimes they take an hour). The rest of the lentils are left in my sprouting container (a 1/2 gallon jar with a screen over it), rinsed and drained. The next morning I rinse and drain again. That evening I take out the needed amount of lentils for dinner, rinse and drain the rest. Next morning another rinse and drain. 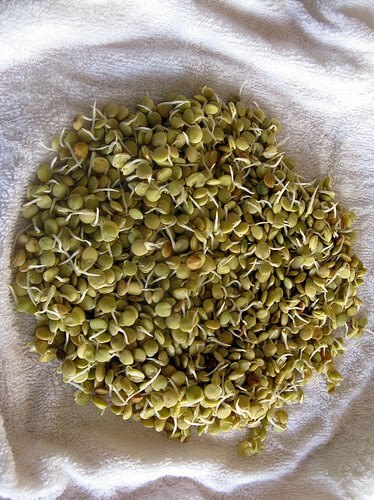 The rest of the now sprouted lentils are used in my final recipe. I should note that for my three meals, I start with 5 cups of dry lentils (picked over to look for stones and then rinsed before soaking). This is a good amount for my family (dad, mom, 2 teen girls and one toddler boy) to have for our dinners plus usually leftovers for lunch the next day. This week promises to be busy. It is spring break which means Kiki will be home and Joe will be working a day shift (7-3:30). The girls have dentist appointments on Monday and Kiki has Hunters Safety Tuesday and Thursday nights. I am quite busy with my new business and figure this will be a more than 40 hour work week between the bookkeeping job and the business. I’m okay with that but it does add to fun around here. We are also having a little snow storm. I’ve heard that we are to expect 8-12 inches over the next three days. That’s quite a bit of snow. I don’t mind it at all but it does make for more work with the chickens and the ducks if it gets too cold along with our snow since we have to haul warm water out to them every few hours. Chickens don’t care for frozen water too much.